Visiting the Statue of Liberty is a popular tourist activity when travelling to New York City with kids (or without). Elizabeth had done research and a speech on the Statue of Liberty in 3rd grade, so it was especially important to her that we visit while in New York. 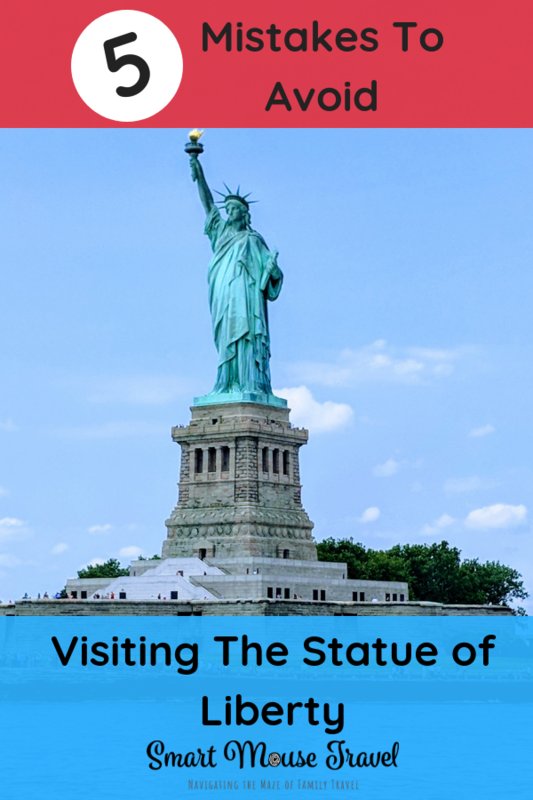 Seeing the Statue of Liberty and Ellis Island was a highlight of our family trip, but could have easily been a disaster if we had made some of the most common mistakes people make when visiting the Statue of Liberty. Tickets for the Statue of Liberty Crown and Pedestal Access sell out months ahead of time. This is especially true during the busy summer season. Crown Access tickets are extremely limited and Pedestal Access tickets are also sold in small quantities. We purchased our Statue of Liberty tickets over 2 months in advance and still only got one of the few remaining Pedestal Access tickets. Crown Access tickets were sold out from the time we booked until over two months past our scheduled trip. Anyone with a ferry ticket can walk around Liberty Island. However, to have any access to the Statue of Liberty you must purchase your Pedestal or Crown Access tickets well in advance. The most sought after ticket is the Crown Access ticket. A Crown Access ticket allows a limited number of people each day to walk up the 393 stairs inside the Statue of Liberty to The Statue of Liberty’s crown viewing area. Please note: The climb to the Statue of Liberty crown is approximately 27 stories. There is elevator access from the ground to the pedestal area, but to reach the crown is another 162 steps. Temperatures inside the Statue of Liberty can be up to 20°F (11°C) higher than outside. The other way to get up close to the Statue of Liberty is to purchase a Pedestal Access ticket. The Pedestal Access ticket allows you to walk up (or take an elevator) to the top of the Statue of Liberty’s pedestal. This pedestal is higher up than I had anticipated and provided some stunning views of New York City. The pedestal has a very narrow walkway that goes all the way around. Visiting the pedestal allowed us to see more of the detailed design on the Statue of Liberty. We admired how the copper was formed to look like flowing fabric and could see how the pieces were riveted together. The pedestal also allowed us a unique view of Lady Liberty. I love some of the pictures we took looking up at her from the pedestal. Although I was disappointed that we were unable to get Crown Access tickets, I am grateful we were able to get the Pedestal Access tickets. We enjoyed being able to enter part of the Statue of Liberty structure. The 3-Day Flex Pass tickets are sold at Battery Park in the Castle Clinton National Monument. These tickets allow you to choose any time in a 3-day window to visit Ellis Island and Liberty Island. It does not allow any access to the Statue of Liberty. I can see how tempting it is to buy the 3-Day Flex Pass ticket. These tickets don’t limit your ferry ride to a specific time or day. However, the security line for this type of ticket is extremely long. I did not realize when we pre-purchased our Reserve Pedestal Access tickets that those tickets would allow us to enter a shorter security screening line to board the ferry boat at Battery Park. We heard the lines could be very long, so we arrived at Battery Park 90 minutes before our scheduled pedestal access ticket time. As we approached the area near the ferries I noticed a huge line of people waiting. After walking hundreds of feet along this line I finally found a Statue Cruises employee. The employee asked to see our ticket. The staff member saw we were a Reserve Pedestal Access ticket. She then directed us to a special queue, which although a long line, was much shorter than the Flex Pass ferry ticket line. Our Reserve Pedestal Access ticket with a much shorter security line still took us 30 minutes of waiting before reaching our security screening. Please note: Any pre-purchased Reserve Ticket (Crown, Pedestal, or Reserve) from Statue Cruises will allow access to the Reserve Ticket security line. This Reserve Ticket line is generally much shorter that the one for 3-Day Flex Pass ticket holders. Most of the security line is uncovered. 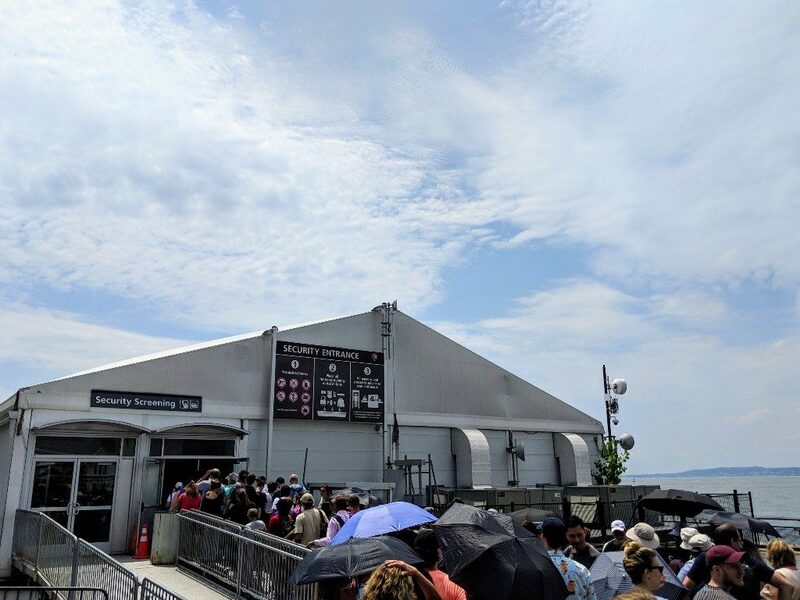 If it is hot and sunny, the line can be very uncomfortable. Make sure to stay hydrated and consider bringing an umbrella to have shade for your wait. Everyone taking a ferry to Liberty Island or Ellis Island must go through a security screening process before boarding the ferry. The security screening is similar to what you would expect at a U.S. airport. All bags go through an x-ray machine and every person must go through a metal detector. After successfully passing this security screening you can finally enter a queue to board a ferry. If you have Crown or Pedestal Access Tickets you will go through one last security screening on Liberty Island. You will enter a small outer building where backpacks, bags, and most purses must be secured in a locker before you are allowed to approach the Statue of Liberty access area. The lockers work like those at the Wizarding World of Harry Potter at Universal Studios where you reserve a locker with your fingerprint as the key. These lockers cost $2 per 2 hours when we visited. The lockers require cash and do not take credit cards (this information is correct at time of publishing). After stowing bags into these lockers you go through one last metal detector. Any loose items like cell phones or cameras get a final airport style x-ray screening. 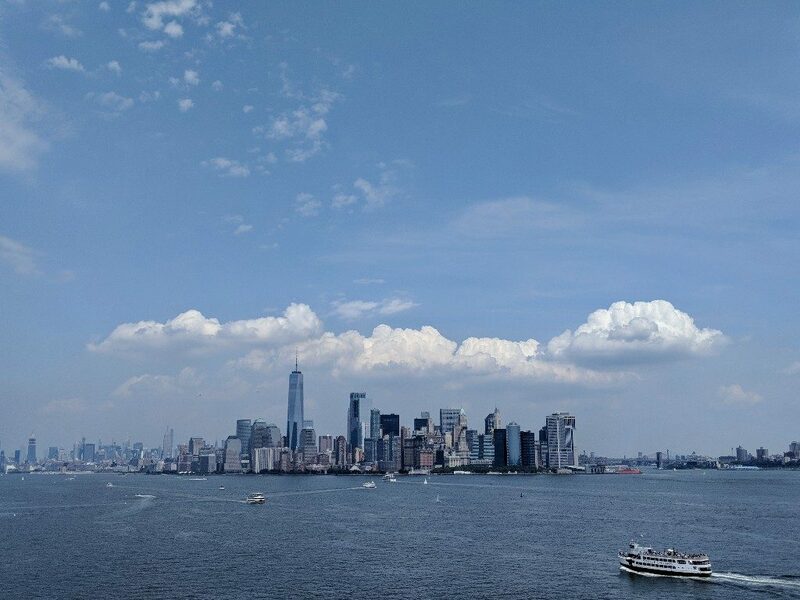 The ferries run on a regular schedule and are on a continuous loop stopping at the Statue of Liberty, Ellis Island, and then returning to Battery Park if you are on the New York City side. The wait time plus loading and unloading for the ferries can take longer than you think. Once we made it through security we entered the ferry line. It took us over 25 minutes to wait for a ferry, load, and then arrive at Liberty Island. We were very lucky when we took the ferry from Liberty Island to Ellis Island. That time we walked right up to a ferry and that trip only took 15 minutes. At the end of the day the lines for the ferries get extremely long. We got in line for a ferry from Ellis Island back to Battery Park around 4:30 pm. Our wait to board the ferry was about 20 minutes. Then because the line was so long it took several more minutes to load onto the extremely full ferry. During our day at the Statue of Liberty and Ellis Island we spent over 90 minutes waiting for or using the ferries. This does not include another 30 minutes for the ferry security screening. The lines and travel time for the ferries used more of our touring time than I had budgeted. We were able to see everything we wanted to at Liberty Island, but we had to cut our visit to Ellis Island short. 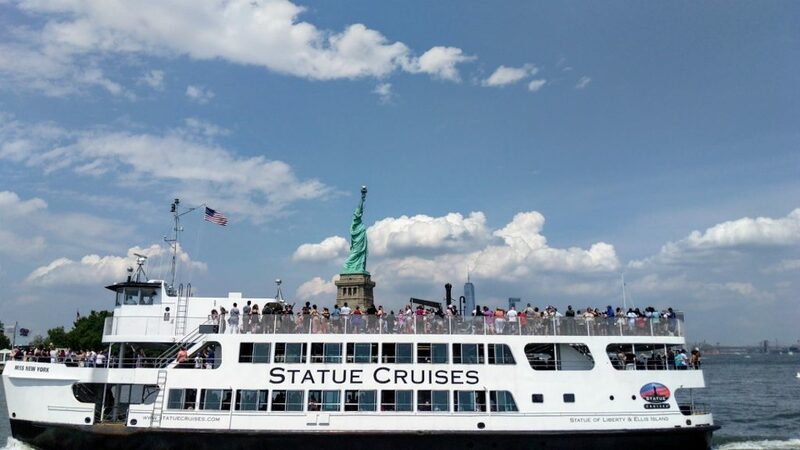 The U.S. National Park Service approves one official ticket broker for Statue of Liberty, Ellis Island, and ferry tickets: Statue Cruises. We saw many people near Battery Park walking around trying to sell people tickets for the Statue of Liberty. Don’t be tempted, as these can be counterfeit tickets. Buying directly from Statue Cruises is the best way to avoid the risk of buying fake tickets. You can also buy legitimate tickets from ticket windows at Castle Clinton National Monument in Battery Park or Liberty State Park in Jersey City, New Jersey. Some hotel concierge also sell legitimate tickets. 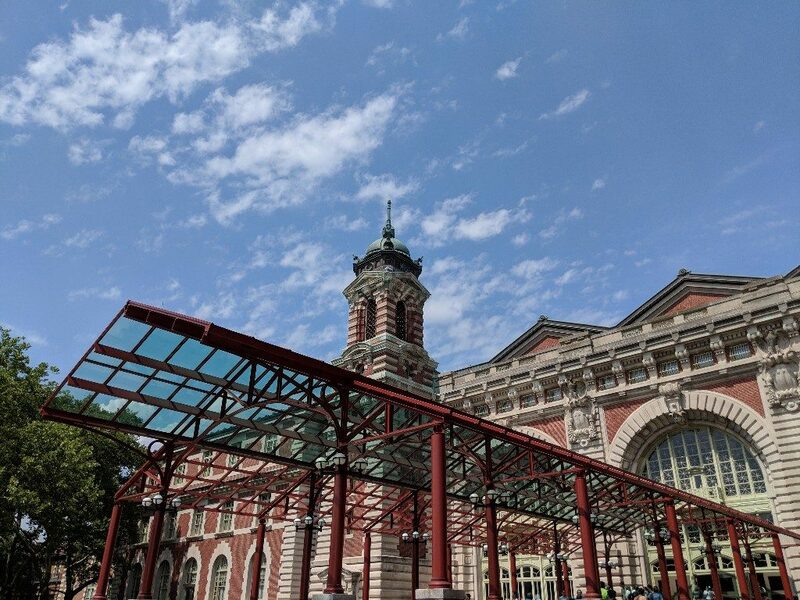 Make sure to have time to visit Ellis Island, too! The Statue of Liberty is an amazing monument and grand symbol of the United States. Seeing this iconic statue was a must for our family vacation to New York City. 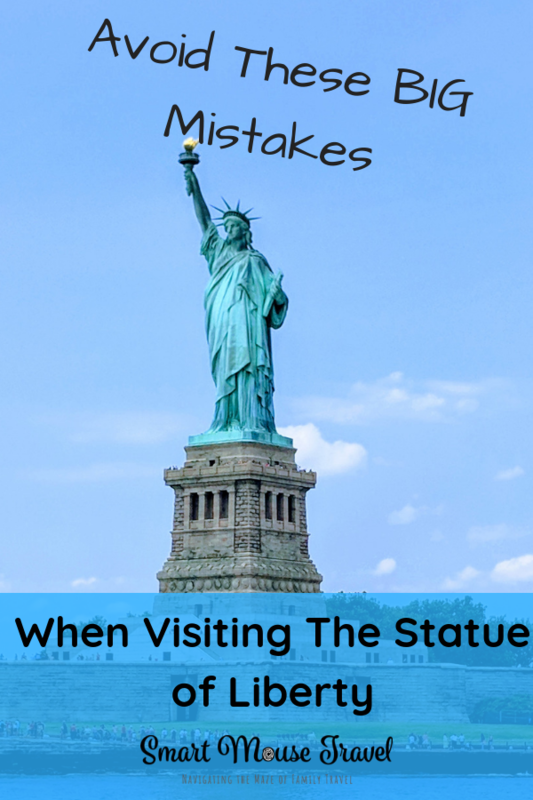 With planning and some luck we were able to avoid the 5 common mistakes people make when visiting the Statue of Liberty And Ellis Island. 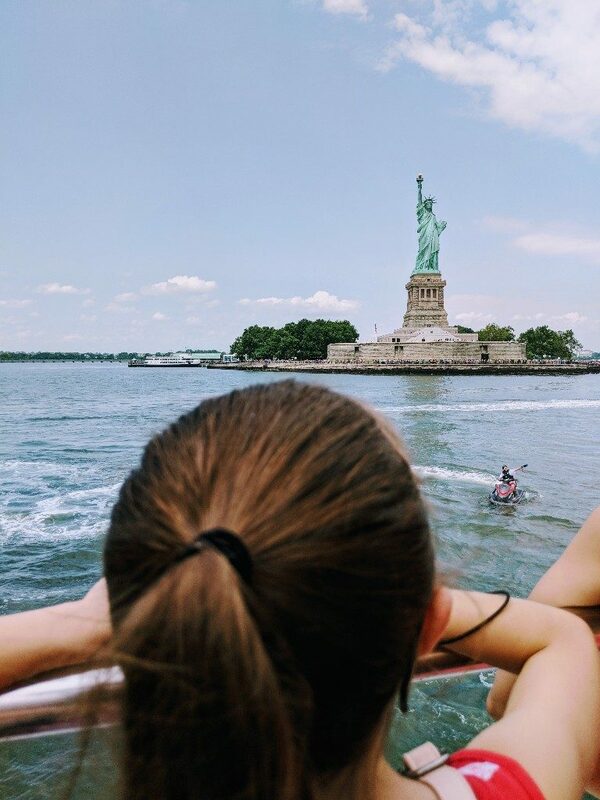 We had an incredible day and want you to have a great experience when visiting the Statue of Liberty with kids. The most important advice I can give is to purchase your Reserve Tickets from Statue Cruises ahead of your trip. My other important tip is to allow yourself most of a day to visit Ellis Island and the Statue of Liberty. This is especially true if you get one of the coveted Crown or Pedestal Access tickets. 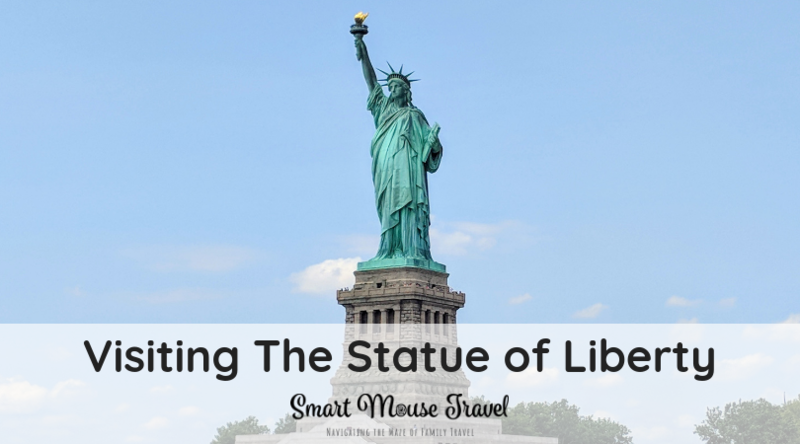 Have you visited the Statue of Liberty or Ellis Island with kids? Are you considering visiting the 9/11 Memorial Museum in New York City? Read our tips for deciding if your kids are ready for the 9/11 Memorial Museum. We are headed to NYC in a few weeks and had no idea that the lines could be so long. This was super helpful, thanks! I’m glad to be able to help. I was pretty shocked at how long the security lines were this summer.